Trump’s threat to the rule of law. Will Trump’s Rule of Law Be Our Rule of Law? The fate of the entire legal apparatus of government is in the balance. 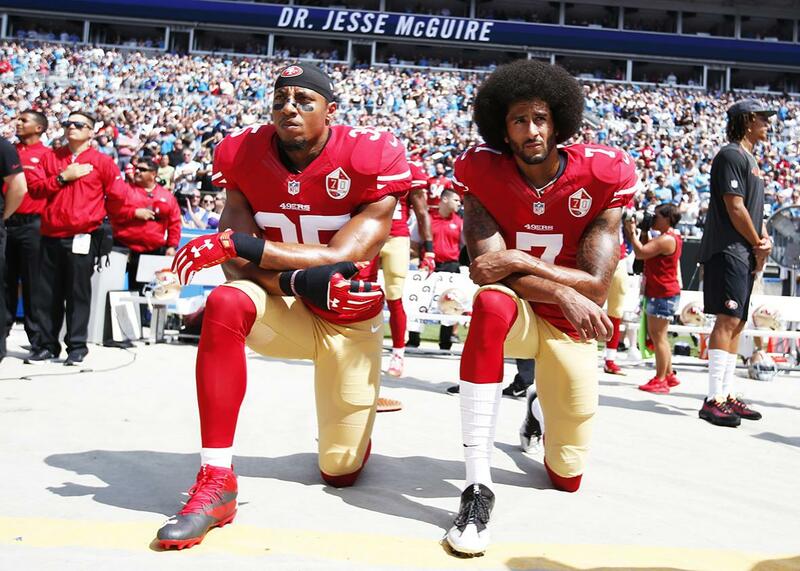 Eric Reid and Colin Kaepernick kneel in protest during the national anthem on Sept. 18 in Charlotte, North Carolina. Can we take a knee in the face of Trump’s “justice”? America has surprised herself Wednesday morning, by democratically electing, to its highest political office, a man with no record of government service and a temperament built of equal parts vengeance and viciousness. America has elected a man who is likely uncheckable as a matter of personality and ensured that he is also uncheckable as a matter of constitutional democracy, by giving him control of the House, the Senate, and the federal judicial branch. I suspect we will come to learn fairly quickly whether the same Republicans who said they deplored Trump’s words and actions, but supported and endorsed him anyhow, will now act to oppose him as president. I believe they are utterly terrified of him. Now more than ever. He would have accepted nothing less of them. Like Andrew Sullivan, I hold out very little hope that most Republicans in Congress will be anything but supine for President Trump as he begins to unspool his broad, unspecified plans to singlehandedly enact unconstitutional stop-and-frisk laws nationwide or to unilaterally dismantle the First Amendment protections for journalists, even though he has no authority to do so. I don’t believe he will build a wall and make Mexico pay for it, but I don’t believe the new Congress would stand up to him to stop that, or his reinstitution of torture, or his immigration dragnets, if he wanted to try. I believe that if President Trump instructs his special prosecutor Chris Christie or Rudy Giuliani to find a way to lock Hillary Clinton up, he would do so, gleefully, and that many millions of people will look on and feel that justice—whatever that means going forward—was done. I find slim hope in the possibility that Paul Ryan or John Roberts will sacrifice everything to protect the newly vulnerable Muslims, and the undocumented, and the LGBTQ teenagers, and the pregnant women. Maybe. But why should they start now? I find myself wondering about the fate of the entire legal apparatus of government—the FBI that Trump has berated constantly on the campaign trail, the career officials at the Justice Department who made noises about quitting en masse if he took office, the generals he has berated and belittled and sworn to undermine. I wonder whether half-floated purges of all political appointees will be realized. Does everyone stay on and do their jobs under a man who is proudly incurious and demonstrably interested only in winning at all costs? Does everyone simply agree to stay on and work their levers, in the hope that they might even mitigate the damage that could be done by one of Trump’s true patriots? John Roberts was forced to sit by silently this year while they maligned his Supreme Court. Judge Gonzalo Curiel was forced to sit silent when Donald Trump disputed his patriotism. In order to be blind, it seems that justice must also keep silent. Over and over Tuesday night, as everything that holds itself out as a check or a balance disintegrated, my thoughts turned to Colin Kaepernick and his campaign to take a knee during the playing of the national anthem, an effort to protest systematic racial inequality in America and ongoing policy brutality. His statement—much maligned, especially by President-elect Donald Trump—that this anthem is not his anthem was prescient, as Americans wake up Wednesday morning to try to decide whether this president will be their president and whether his law will be their law. All night and into Wednesday morning, I have been imagining Hillary Clinton’s concession speech. Does she concede graciously, with a call to her supporters to unify behind a man who has no impulse control and no guiding moral doctrine beyond self-enrichment? Does she concede as though she has lost to a Kasich or a Rubio? Or does she take a knee, and risk openly fracturing a country that is perhaps too fragile to recover? The asymmetry here was always plain. Trump was either going to win or he was going to dispute his loss and cash in. Clinton, for her part, was always going either to win and to be unable to govern or to lose and concede graciously. If one is unconstrained by consequences and unafraid of normalizing the intolerable, such choices become vastly easier. For those of us who believe—as the Clintons do—in the basic tenets of constitutional democracy, in respect for the law, and the courts, and for neutral processes, Trump is the end of that line. These words that we use, due process and equality and justice have actual force and meaning. They are the tools and also the end product of the entire enterprise of democracy. They are the only bulwark against totalitarianism we know. Donald Trump has never seen the law as anything beyond another system for self-enrichment. Judges are tools. Laws are malleable. True justice flows in a singular direction: toward him. And Wednesday the entire edifice of the American legal system answers to that vision, unless it opts not to. Lawyers are by definition small-c conservative, incrementalist, and cautious. We don’t do revolution if a strongly worded footnote would suffice. We believe in facts. We believe in neutral rules and principles of fairness. We believe in judicial independence. We will be more apt than anyone to try to shift along in Trump’s America, doing our best. Hoping to make it a little more just for the weakest around the margins. I don’t know how Hillary Clinton—a consummate lawyer, a small-c conservative by temperament and by design—concedes to this regime. I imagine she feels that for the good of the nation, she must. And for the good of the nation, lawyers across the country need to suit up and do the work to minimize the damage Trump can cause. But today, I am taking a knee, in the face of “justice” that bears no resemblance to what is just and the imminent prospect that the rule of law is about to become a machine to grind up the weak and betray the powerless. This is not the rule of law as I understand it. It is the systematic deployment of law to promote one man. See more Slate coverage of the election.